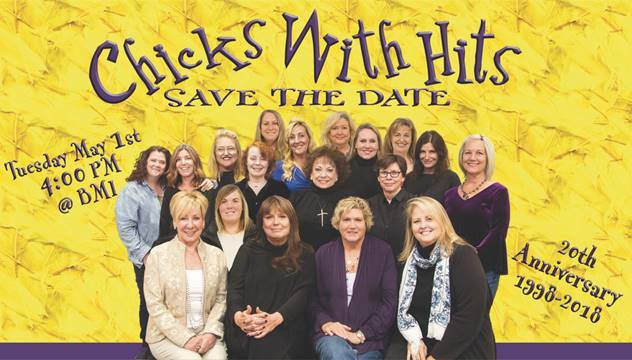 The Chicks With Hits is an all-female independent music publishing group based in Nashville, TN. Eighteen current members have been integral catalysts in the careers of many of Nashville’s hit songwriters, artists and award winning singles. Collectively, they represent 75 active songwriters/recording artists and have had songs recorded by more than 150 artists including Carrie Underwood, Kelly Clarkson, Cyndi Lauper, Dolly Parton, Faith Hill, Garth Brooks, Tim McGraw, Jason Aldean, Jimmy Buffett, Keith Urban, Kenny Chesney, Little Big Town, Jo Dee Messina, Luke Bryan, Reba McEntire, Taylor Swift, Old Dominion, Sara Evans, Lady Antebellum, Dierks Bentley, Miranda Lambert, Sam Hunt, Chris Stapleton, Kacey Musgraves and many more. “The Chicks with Hits is a sorority, a sisterhood, and a family. We not only support each other, we champion each other and not just in the music business, but also in our personal lives. We thrive on friendly competition, because it makes us all better. We have an unspoken motto and that is 'when one of us succeeds we all succeed.' Sharing in that team spirit is what makes us a unified force. We are not without faults; we argue, we disagree, and we rant like any large family but we always find a way to come together. We are a unit of strong willed, confident, opinionated professional women who truly care about the well being of each other, our songwriters, the music, and our colleagues in the music industry.” Reflects Chicks member, Melanie Howard. As the music publishing industry has changed, The Chicks have changed with the times. Its core business of great songs remains front and center, but the group also works in artist management, has formed independent labels and consulting groups, and developed digital marketing strategies. Chicks’ songs have also seen considerable success in TV/Film licensing including placements on NASHVILLE, Lucifer, The Ranch, Bones, Shameless, Parenthood, and HOUSE. A celebration honoring the Chicks with Hits Anniversary at BMI attended by Nashville-based music industry members, including record label executives, producers, recording artists, songwriters, artist managers, music publishing executives, A&R representatives, booking agencies and film/television music supervisors.